Games Made Quick 3 Entry: Bouncy light puzzles! Buy and sell lives - just like real war! A puzzle game about guiding a spirit home. A fast-paced, bullet-reflecting, 2D sidescrolling shmup. I really liked the art and music, and the gameplay was an interesting idea - though I did find myself clicking around randomly a bit. A really nice demo, with a cliffhanger that makes me want to see the rest of it. I like the semi-chromatic art style as well. I hope you do continue it and I look forward to playing it in future! First of all, I loved the music - it's memorable, but also varied enough that it doesn't get boring. The pixel art looks great, especially with all the lighting and shadow effects. The puzzles were simple, but the dialogue really carried it through. I don't know if you'll continue it, but I'm definitely curious to know what happened! I'm honestly stunned by the polish of this game - especially in such a short time! The light tone of the aesthetics and the flavour text offsets the more grim elements of the plot, without detracting from it at all. I just love the attention to detail of it all, the compelling characters, the writing, the soundtrack. Seriously, well done on a fantastic entry! Really wholesome message, pleasant art, and really inclusive. The sheer number of flags in there really hammers home how different we all are, and yet how there's space for all of us. The minimalistic synth is really nice too. I am terrible at this game. It feels really good to control though! And it's really pretty, especially the chromatic abberation effect. Wow. The writing in this is really powerful. Slightly painful at times too. A lot of this is relatable, even though I'm not aromantic. I think it's really important that we communicate that doubt is often a part of learning about your own identity, and that it's OK to do so, whether it sticks or not. Thank you for talking about that. The aesthetic is really nice! The sprites, colours, and even the font! I also love the shared, double-ended health gauge. Trying to look out for two characters at once is tricky, but conveys their focus on each other perfectly. What a just genuinely pleasant time! It felt so nice just looking for all the little things scattered all over the place. Really elegant use of the theme. When the levels get tough, you really start to dread falling out of the colourful zones. The awkward controls for jumping in the unsafe space was literally painful at some points - which maybe doesn't seem so good? But it definitely gave the right effect, so I'm all for it! I also really appreciate that you can't even tell what your own colour is until you're in a safe space. The sort of colour masking effect of the safe spaces looks really neat too. A nice simple representation of the theme. Definitely gets the point across with the rather blunt text and difficulty. It's beautiful how you managed to convey your message visually with such simple interactions. I wasn't really sure what I was meant to be doing, or whether I was doing it right, until I noticed what was happening around me. Which is pretty perfect :). I love the frantic multitasking this game makes you do! I was completely lost at first, but that sort of feels right for the atmosphere. The difficulty is pretty steep but maybe that's just because of how many crew members I took. The ambient music is really nice too - it sets the tone but isn't too dominating. Also, bonus points for the literal rainbow of hair colours! 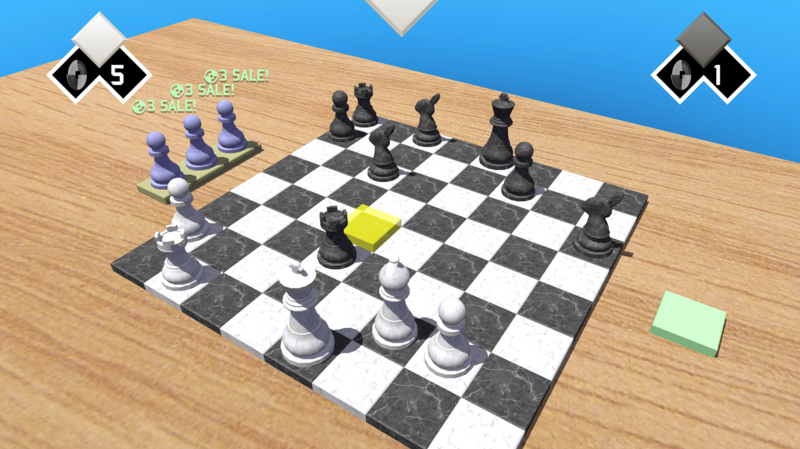 Chess Jam community » Share Progress · Created a new topic Finished making Purchess! I've been thinking about this way too much - but think about this: what are the two defining traits of the Knight in chess? They jump over other pieces. They move sideways in the air. So, I've decided. My entry will have bunny knights. Apparently it was a nerf added after the double-first-move made pawns too OP. I've heard of castling before, but didn't know how it worked. I have never heard of an en-passant capture. Glad I'm learning this stuff now, before the jam starts :P.
Chess Jam community » Discussion · Posted in What makes a game feel chessy? I do find chess magical just in how kind of perfected it is - in the sense that it contains so few simple rules and pieces that return so much complexity. It's basically what any puzzle game designer aims for, but as you say honed over literal ages. It's hard to imagine you would design it the way it is now if you were starting from scratch, but it just works. Also, for all I said about abstract ideas of chessiness, I think I probably will end up with something mostly following the rules of chess. I think that's fine, as long as you're exploring something that you find interesting about it. Chess Jam community » Discussion · Created a new topic What makes a game feel chessy?